I enjoyed Julie Turnbaugh's article about 'American' mice (November/December 1996, Volume 2, Issue 6), and would like to respond to a few of her points. My mice maintain that they are not nationalists, but they would hate to have their American cousins thinking that all English mice are feeble! I think that the terms 'American mice' and English mice' are very confusing. What you call 'English mice' in America are not simply mice imported from England, although I gather that they are all descended from imports from England. Show-quality fancy mice are usually called 'show mice' over here; the term 'fancy mice' is probably more accurate, since they are bred within the mouse fancy, but often the term 'fancy' is used to describe any mouse which is more exotic than the pet shop albino. Our show mice are the ones that are occasionally exported, and so in the U.S. and elsewhere, they are known as 'English mice'. This is a label I can live with. English show mice are perhaps distinctive looking enough to warrant something like a dog's breed name. 'American mouse', however, is a different matter! What is often referred to as the 'American mouse' or the 'Swedish mouse' can be found in pet shops all over England and probably the world! They are not, as far as I can tell, a single distinctive variety -they are simply mice that happen to live in America (or Sweden, or wherever) which are not English mice. I think this is misleading; it's like saying that every dog in England which is not an American Pit Bull is an English Setter! It would probably be more accurate to describe all mice which are exhibited as 'show mice' (they are being shown, after all), and for the English mice to be 'English show mice'. I did not recognize the mice shown here in England from Julie's description of her English show mice in the U.S. Show mice here certainly live for a lot longer than 4 months; many live to two or three years, although it is fair to say that most live for between 18 months and two years. Most of the very early deaths that I have seen in pet mice (at 6 months or younger) have occurred in animals of mixed ancestry - ordinary, pet mice, rather than show mice. 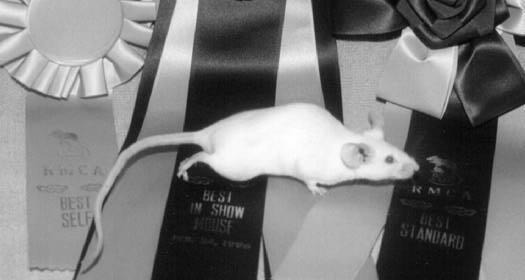 Chronic health problems are rare in show mice, because fanciers do not breed from sick animals. Mouse fanciers in the UK tend to be very ruthless about only breeding from the best and healthiest mice; they don't have any incentive to breed from weak animals, and they certainly won't breed from does that are unlikely to be able to rear their litters successfully. In my experience, show mice in England are generally healthier than the average pet shop mouse; they are almost always much more docile and confident. Breeders select for confident and docile animals, because with mice, just as with dogs, horses and probably humans, a nervous animal does not show itself to its best advantage. Some very inbred strains of show mice do tend to be very nervous - Dutch and spotted (Broken and Even-marked) in particular - but even then, they are rarely any more nervous than the average pet shop mouse. Most show mice in England are extremely calm - a highly strung animal will not do well at shows, after all. This is what English show mice are like in England; obviously, from Julie's experiences, English show mice in the U.S. and in Sweden are different. It is possible the poor health of 'English mice' abroad is a result of inbreeding once they have left the UK. Normally, only a few mice of each variety are exported at a time, and this means that, in order to keep a strain of purebred English mice, the American (or Swedish) breeder has to keep breeding her imports and their offspring together. The gene pool in this situation becomes very restricted, and, without careful selection for healthy animals, close inbreeding over a number of generations can produce weak mice. If a strain of show mice over here starts to deteriorate, the breeder can outcross it to any number of other strains; in the U.S. and Sweden, I imagine that the pool of suitable potential outcrosses which would preserve the pure English blood of the strain is small. Any dangerous but recessive traits carried by the animal are likely to be expressed. Resistance to infection declines, possibly as a result of decreased variation in the animal's genetic material. However, many livestock breeders successfully practice close inbreeding over many generations and still produce exceptionally healthy animals. This is because they breed from only the healthiest animals, and so beneficial characteristics spread through the population instead of harmful ones. The current system of reserving some classes for purebred English mice could be changed to one where various classes were reserved for mice which were NOT of purebred English stock. English mice could still compete in open classes, but in recognition of the fact that they have a head start over other show mice (i.e., about a hundred years' worth of English breeding) they would not be allowed to compete in all classes. This would provide an incentive for breeders to show other mice, and also to outcross their English mice to other lines without fear that the progeny could not be shown. It echoes the practice in dog shows of limiting entries to classes according to how many prizes the dog has won in the past. Julie said that most of the colours and coat varieties were developed in the American strains, not the English. I do not think that this is true. I have seen mice in England of just about every variety I have ever heard described in the U.S., and these were home-grown, not imported. The same color and coat mutations tend to crop up spontaneously time and time again, so it is possible that some varieties have occurred in several countries at once. However, when English mice are exported, I imagine that only a limited range of varieties are shipped over. The mice with the most striking type (big mice with lovely huge ears and long tails) in the UK are normally shown in a limited number of colors. It is often the case that the unusual colors are hard to breed to the same standard, and so people will import the 'typey' mice rather than the colorful ones. Some varieties of English show mice, especially the newer ones, look just like pet mice the world over!